No, you are not seeing double. No, this is not deja-vu all over again. 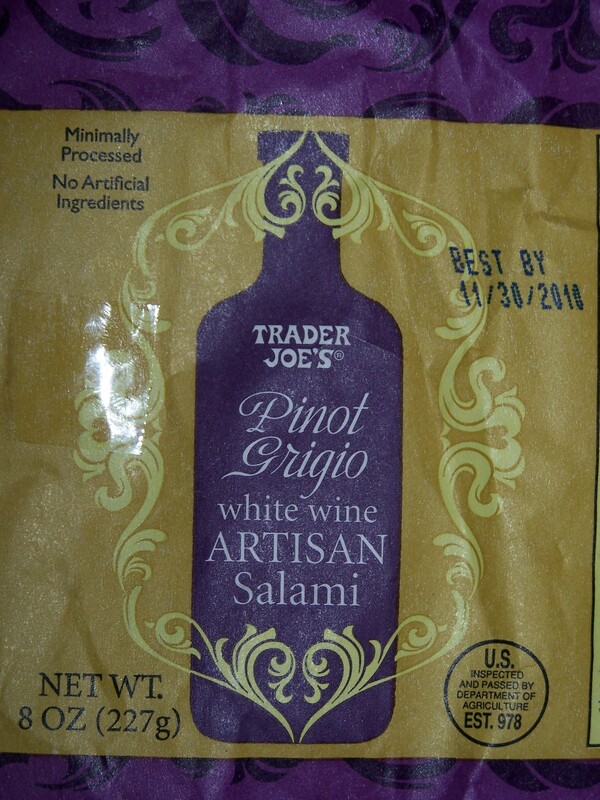 This is a slightly different version of Trader Joe’s Artisan Salami. This, the Pinot Grigio variation. As noted previously, I believe Trader Joe’s Artisan Salami is made by master salami maker Volpi. But, if it is not, it is still masterful salami. In comparison to the Chianti version, the Pinot Grigio version is a little milder in taste. Whether that’s due to the use of Pinot Grigio wine concentrate versus the Chianti type, is up for debate. My feeling is there’s just a little less garlic in the Pinot Grigio version. Again, at around a couple of bucks less than a big-box supermarket, Trader Joe’s is the place to pick up either of these classic salamis. This entry was posted on 10/03/2010 at 14:17 and is filed under Recipes, food, cooking and related items, Trader Joe's. You can follow any responses to this entry through the RSS 2.0 feed. You can leave a response, or trackback from your own site.